One time fee to rehome a single pet. One time fee to rehome two pets. One time fee to rehome three pets. One time fee to rehome four pets. Follow up is provided at no extra cost to the pet owner. When a pet is placed with it’s new family, an adoption fee is collected. This covers our costs for providing a full year of follow up services, to ensure that your pet is where and with whom they are supposed to be – and that they are being well cared for. 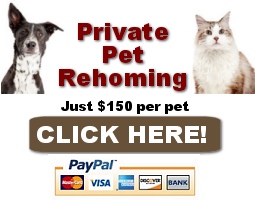 Find My Pet A Home offers our pet rehoming services for the affordable, one-time fee of just $150 USD per pet. No matter what your pet’s age, size or breed may be, our fee is the same low fee, providing there are no serious health or behavior issues. Our affordable fee is all-inclusive, and goes towards our costs in locating the perfect new home for your pet. There are many costs involved in the search for your pet’s new home. Our staff leave no stone unturned, working long hours promoting your pet’s information to a wide variety of pet adoption websites and social media. We use modern and traditional methods in our pet rehoming outreach; our staff place phone calls to local pet businesses and services in your area, and also set up paid social media campaigns targeted to pet lovers within a 50 mile radius of your location. No matter whether it takes us a few days – or months to find your pet’s new home, our one-time fee covers everything. PROFESSIONALLY WRITTEN ADS To Create an HONEST, Yet Very Compelling Story about Your Pet. Creating a highly-targeted local SOCIAL MEDIA CAMPAIGN for your pet. NOTIFYING local pet related services, businesses and organizations about your pet’s need for a new home! A Detailed ONLINE ADOPTION APPLICATION FORM For Prospective Adopters To Fill Out. Their information is sent INSTANTLY to your email. BACKGROUND CHECKS on potential Adopters you wish to consider. Thorough REFERENCE SCREENING on potential adopters you wish to consider. Emotional support, advice and counseling. We will carefully rehome your pet – and – WE ARE HERE FOR YOU! You stay ANONYMOUS! Keep your phone number, email address and contact information completely private while we take calls, texts and emails on your behalf. Your SAFETY and PRIVACY is our FIRST PRIORITY! 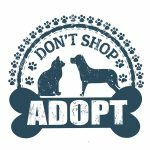 Ready to get started on your Pet’s rehoming project? Just fill out our request form here, or call us toll free at 888-720-3322.